The Hajjar STEM Center, which opened in Fall 2015, integrates the disciplines of science, technology, engineering, and mathematics (STEM). 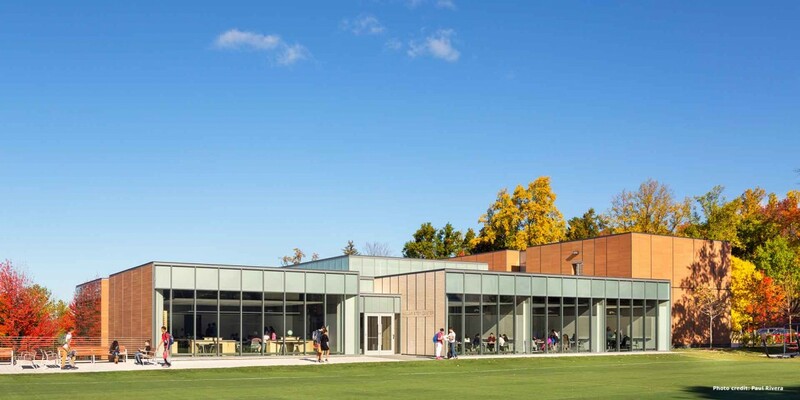 The building is an integral component of Dwight-Englewood School’s Master Plan, initiated in 2005, and features open spaces and flexible lab and classroom areas the maximize collaboration and interaction among students and faculty members. The building was designed by Gensler, an interaction firm of more than 3,500 architects, designers, planners, and consultants, which is known for its forward-thinking, award-winning designs and commitment to sensibility. Gensler has designed the D’Angelo Center at St. John’s University, the Blum Center for Developing Economies at the University of California, Berkley, and St. Phillip’s Academy in Newark, among other high-profile projects. Gensler served as the architect for D-E’s Master Plan and is currently chaired by Trustee Emerita Robin Klehr Avia. Levien & Company, an intermediary and advisor, provided project oversight, coordination and reporting, managing, and facilitating of the day-to-day work of all the parties. Levien has recently completed projects for independent schools like Fieldston, Calhoun, Browning, and Packer Collegiate. The design of the Hajjar STEM Center was informed by a year-long fact-finding mission that was undertaken by Head of School Dr. Rodney De Jarnett, a core group of Upper and Middle School administrators, faculty members in mathematics, science, and technology, and Gensler architects, who visited more than a dozen schools and universities with STEM facilities, including MIT and Phillips Exeter Academy. The building was designed from the inside out, starting with the individual classroom and lab spaces and moving on to how these areas interact with each other. 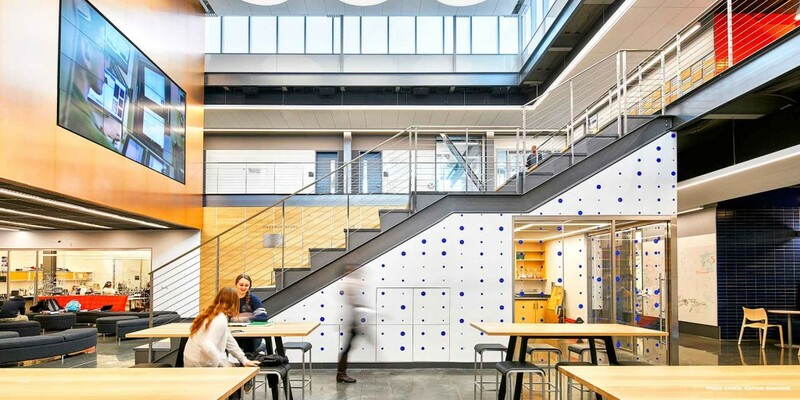 With significant input from D-E faculty and administrators, Gensler worked to ensure designs reflect the pedagogical requirements of the D-E curriculum and the vision for a more closely integrated teaching and learning experience across the STEM disciplines. The building’s shape and exterior reflect the function inside, meaning that form will follow function. Since opening, the Hajjar STEM Center has been recognized internationally for its design. Click here to learn more. The new Hajjar STEM Center totals approximately 30,000 square feet, with 18,500 square feet for laboratories, classrooms, and offices, and 12,000 square feet for infrastructure and circulation. The infrastructure includes large open spaces for students to work with teachers and talk among themselves, a best practice identified by a fact-finding team. The building is located to the north of Leggett Hall and wraps around the northwest corner of Leggett Field. There are multiple access points to the building through a location situated on the northwest corner of Leggett Field. Biochemistry laboratories incorporate fixed lab tables for 18 students and Harkness tables configure in several ways. Physics labs provide for flexible open space and not have fixed lab tables, which allow for experiments and large or small group discussions. Mathematics classrooms maximize flexibility with projectable writing surfaces on three walls and seating for 18, which may be configured in multiple ways. – All STEM building spaces should be able to serve multiple purposes with furniture that is flexible. The intent is to allow several kinds of activities in an open learning space. – Learning can and will happen outside of the actual laboratories and classrooms, both inside and outdoors. – D-E students will be best served by multi-zone teaching spaces with maximum flexibility. -Dr. John Hajjar, M.D., Former President, D-E Board of Trustees and former D-E Parent (Marc ’07; Brian’11; Michael ’11).